In my two and half year tenure as CEO here at X1, we have seen tremendous progress and exciting growth with our next generation search solutions: X1 Search 8 and X1 Rapid Discovery. During this time, I have taken the very valuable opportunity to listen to our end users, executive sponsors and key stakeholders in IT about their X1 experience, their input on our product roadmap, and their perspectives on broader enterprise search. On the enterprise search front, the recurring theme we hear again and again is that outside of the data managed by X1, enterprise search is a source of major frustration for organizations. This is confirmed by survey after survey where the vast majority of respondents report dissatisfaction with their current enterprise search platform. Simply put, the traditional approach to enterprise search has not worked. This is largely because most search solutions deployed in recent years focused on IT requirements — which see search as either a technical project or a commodity —rather than being end-user driven. At X1, however, many of our customers report real progress with enterprise search, with firm-wide X1 rollouts being major wins at their organization. We believe that X1’s unique focus on the end-user is the key. You won’t find many other business productivity search solutions where the end users drive demand, instead of the tool being imposed on the end-users by IT or systems integrators. We continually hear countless testimonials from our users, at companies large and small who swear by their X1 and cannot imagine working without it. In speaking with industry analysts and other experts in the enterprise search field, this is an almost unheard of phenomenon, where end-user satisfaction with the companies’ enterprise search platform is usually around 10-15 percent, verses the 80-85 percent satisfaction ratio we see with X1. So in view of this customer and industry feedback, we coined the phrase “business productivity search” to differentiate what X1 focuses on verses most other enterprise search tools, which are typically re-fashioned big data analytics or web search appliances. And the feedback we’ve received on this from end-users and industry experts alike is that this assessment hits the nail on the head. Business productivity search is not big data analytics and it is not web retrieval. It is its own use case with a workflow and interface that is tailored to the end users. X1 provides the end-user with a powerful yet user-friendly and iterative means to quickly retrieve their business documents and emails using their own memory recall as opposed to generic algorithms that generate false positives and a workflow ill-suited to business productivity search. 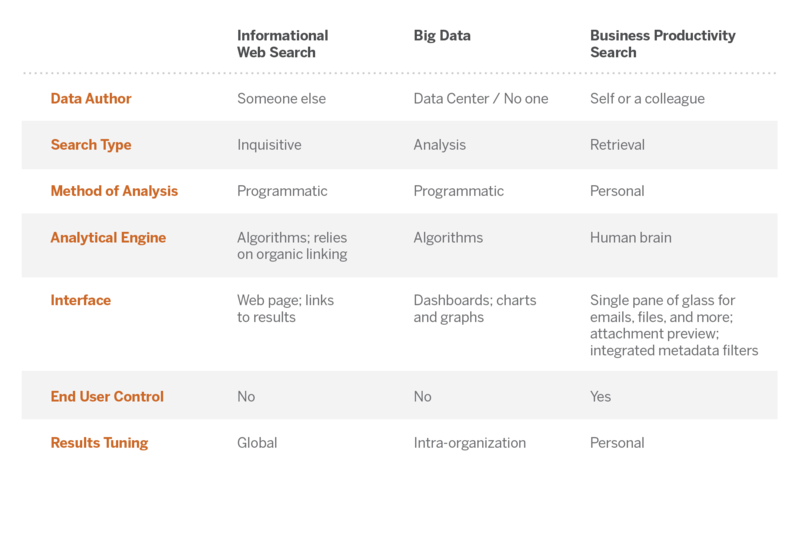 This analysis is crystalized in the accompanying chart differentiating X1’s approach to business productivity search versus big data analytics and web search. These points are further explained in our four page white paper: Why Enterprise Search Fails in Most Cases…and How to Fix It. But perhaps the most compelling illustration is this testimonial from 2013 Nobel Prize Winner in Chemistry and Stanford professor Dr. Michael Levitt, who states: “X1 is an intimate part of my workflow — it is essentially an extension of my mind when I engage in information retrieval, which is many times an hour during my workday.” In my opinion, you will not find that level of enthusiasm by end-users for other enterprise search platforms. And X1 is a platform. Users need a single-pane-of-glass view to all of their information – email, files, SharePoint, archives like Symantec Enterprise Vault, and other enterprise repositories. X1 Search 8 and our enterprise extension X1 Rapid Discovery provides just that – a user-friendly interface to all information that lets workers use their minds to find what they are looking for in an iterative search tailored by the end user. But the hundreds of thousands of X1 end users know all this. The key takeaway for CIOs and other IT executives is that search is an inherently personal user experience, and the number one requirement, by far, for a successful search initiative is enthusiastic end-user adaptation. If the business professionals in your organization are not passionately embracing the search solution, then nothing else matters. Anyone in the search / eDiscovery business lives and breathes search – we think about all day, every day because it is our livelihood. At X1, we have many customers making real progress with enterprise search, so there can be the perception that organizations have learned to address the very real challenge of helping employees find information. Thus, it can be surprising to run into research that shows just how bad the traditional approach to enterprise search is. Almost half of the survey respondents in large organizations (1,000 employees or more) find it difficult or very difficult to find information. Almost two-thirds of respondents are either dissatisfied or very dissatisfied with their existing search applications. Almost two-thirds of respondents believe it is very important to improve the ability to find the right information. Simply put, traditional enterprise search did not work. Too many employees complain about not being able to find what they are looking for. The search solutions deployed over the last 15 years focused on IT requirements rather than end-user requirements. These tools required end-users to tag and rate their search results, something end-users have neither the time nor the emotional investment to do. This very point is something that Marcus Stimler, CTO of Capgemini UI, points out on the webinar we did earlier this month – the reliance of traditional search tools on end-users to tag information leads to a lack of findability. This survey just confirms that fact. It is not all doom and gloom, however, as many X1 customers know. There is a better way to approach enterprise search and it begins with the end-user. In today’s business world, end-users know what they want. They demand good experiences with technology. A web page with links to search results will not cut it in the enterprise. Users need a single-pane-of-glass view to all of their information – email, files, SharePoint, archives like Symantec Enterprise Vault, and other enterprise repositories that users might access. X1 Search 8 provides just that – a user-friendly interface to all information that lets workers use their brains to find what they are looking for. Beyond the desktop, X1 Rapid Discovery indexes other sources of content – either on-premise or in the Cloud – and makes the information available alongside a user’s local content. Perhaps the beauty of this approach lies mostly with its simplicity. Workers are happy because they can find information. IT is surprisingly happy because they have a search tool that is easily deployable, as opposed to the traditional complex science project. This overall happiness is a result of a new approach to enterprise search starting with end-user requirements and extending outward. It is a subtle difference, but a meaningful one that will drive the results of future findability surveys to a new level. For more on our perspectives on why enterprise search initiatives often fail, while X1 is invariably successful, please download this short treatise. This was inspired by direct feedback from many successful X1 install sites. 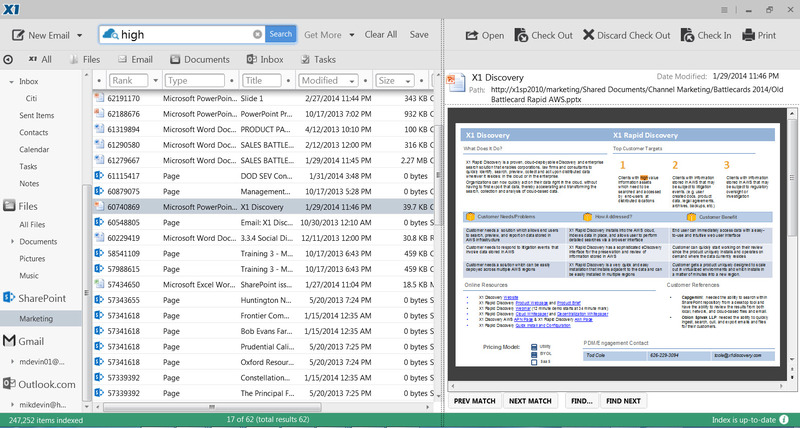 In a nutshell, X1 addresses users’ personalized requirements for business productivity search. A key mistake is to take big data or web search solutions and apply them to the very different use case of business productivity search. The matrix displayed here illustrates the key differences between these use cases. There is huge interest in the Social Discovery product and that business continues to grow. In fact, I would argue that social media discovery is the most exciting topic in the eDiscovery world and generating far more business and activity than any other segment of the market. Customers deploying virtual desktop (VDI) environments are excited by the Search 8 Virtual Edition, which allows them to provide great search experiences for business workers while also disabling Windows indexing (a best practice in desktop virtualization in order to conserve virtual resources). With the growth of the Cloud and more and more enterprises storing active data in Cloud-based repositories, the ability to search data in the cloud is a hot topic. But, as I wrote about previously, cloud search is not necessarily as simple as just creating a connector. We continue to see X1’s ability to deploy in the cloud as a driving force behind deals. No topic, however, turns as many heads as hybrid search. When I talk to people about our product set, heads nod and they see the value. After a few minutes, the “aha moment” occurs. I don’t even have to say the term – my conversation partner will say to me, “wait, so you can enable search across both on-premise and cloud environments…you can do hybrid search.” It feels to me like hybrid search is one of those “next big things.” To have so many diverse people, from different business sectors really dig in to a conversation on hybrid search gives me all the proof I need to know that we are on to something here. Take a look at the following screenshot. The beauty lies in the simplicity – one single pane of glass to a business worker’s most critical information assets. No need to switch around between applications. 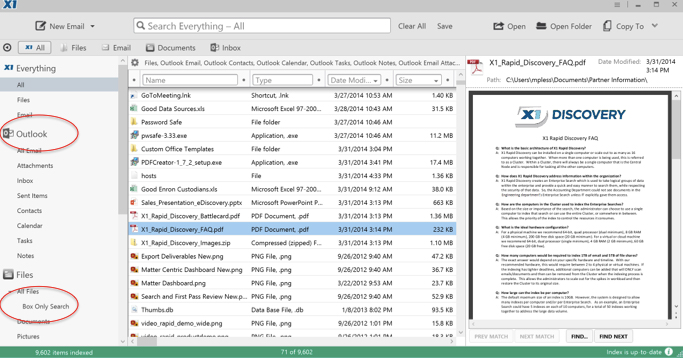 No need to search Outlook for email, then log into Box to search for files stored there. It is a single interface to search for information, no matter where it lives. And that kind of interface fits the workflow of business workers. That drives tremendous value – that is why everyone gets the importance of hybrid search, and why it is the next big thing as far as I am concerned. I had the pleasure of conducting a SharePoint eDiscovery webinar with Patrick Burke of Reed Smith for the OLP last week. The subject is fascinating because finding, preserving, and reviewing SharePoint content in the litigation/investigation context can be so challenging. The metadata users add to content (e.g. workflow tasks), the web page interface that creates more native ESI than just a document, and the decentralization of SharePoint deployments make eDiscovery for SharePoint a topic unto itself. Often lost in this topic is the issue of end-user search of SharePoint. When I talk about end-user search in SharePoint, most people just assume that the search functionality baked in to the product (Microsoft acquired FAST Search & Transfer several years back) is enough. In some cases, that will be correct, but in others it does not work to give business users efficient access to information. Some companies have standardized on SharePoint as an enterprise content management (ECM) platform while others have some departments that use SharePoint for sharing files and managing specific business processes. In either situation, the reality is that business workers store information in multiple places – SharePoint, email, network file shares, etc. To find that information is often a frustrating task of switching from application to application only to have a subpar search experience. The experience leaves something to be desired in that I have to execute several more clicks on the left to do any kind of filtering and, in the result set itself, it is very difficult to know if any of these are the document I am looking for because I can’t see the document itself. I would need to open it first. In addition, as a business worker, I probably don’t know if I should be looking in email, file shares, or SharePoint for the document I need. I know I saw it somewhere, but can’t remember where. In this search experience, if I don’t find what I am looking for in SharePoint, I now have to go search my email and then my file system. It adds up to a waste of time. 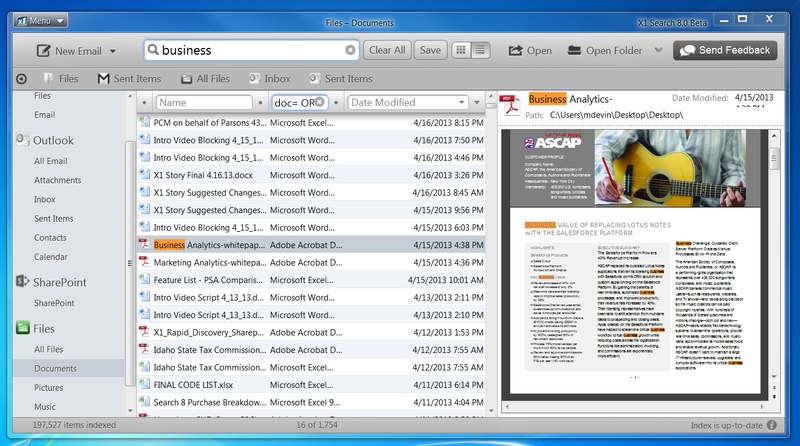 In this user interface, I can search across email, files, and SharePoint. I can see a full-fidelity preview of the attachment. I can refine on any kind of metadata. It is a positive search experience that is helpful and allows me to be efficient. More and more people realize now that this unified access to information is critically important. That may be why SharePoint guru Joel Oleson said, after a X1 Search 8 product demo, “the great news is seeing unified search across the variety of platforms [email, file shares, SharePoint] in a single powerful desktop product priced very reasonably.” It’s because business workers really do need that unified interface across all information. To be forced to move from email to SharePoint just to run a search can be frustrating and time consuming. For SharePoint administrators, not having to worry about a user’s search experience in SharePoint is liberating. When business workers and IT administrators are both happy, the world is a better place. We are taking a break from eDiscovery and investigations to discuss some big news in the world of X1 search. Today I am excited to announce that we launched a major upgrade to our popular desktop search software, X1 Search 8. In addition to a new, very sleek interface (see screen shot below), and a faster and more scalable index, X1 Search 8 (X1S8) features two distinct game-changers. First, X1S8 comes with a built-in SharePoint connector. SharePoint is proliferating throughout the enterprise, and X1S8 provides an outstanding search experience of SharePoint, which we believe is a vast improvement over native SharePoint Search. All search results are displayed in a single sortable view with a full-fidelity preview pane, in the same view as your local files an emails. 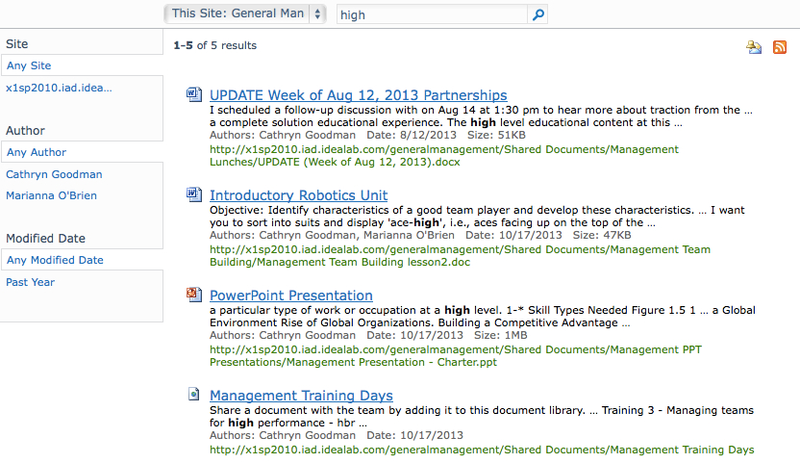 The feedback from many enterprises is that X1 now has the best search of SharePoint in the business. The second game-changer is that X1 Search 8 is fully compatible with desktop virtualization. Finding content is difficult enough on a traditional desktop, but the issue is compounded with the virtualized variety. There are many compelling benefits to desktop virtualization, but the architecture does not facilitate or even enable traditional desktop search solutions. X1 Search 8 provides search capabilities across physical, virtual and cloud environments with results returned in a single pane. X1 was specifically architected to uniquely and seamlessly operate in virtual desktop environments, including popular Citrix solutions XenApp and XenDesktop. Here is a 2 minute video demo overview and another demo video specific to our integrated SharePoint search support. At just $49.95 per seat, X1 Search 8 is a time-saving, intuitive tool that saves enterprises time and money. For more information, visit www.x1.com.